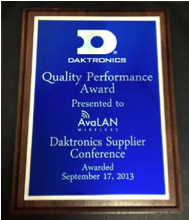 AvaLAN Wireless Systems was awarded a Daktronics Supplier Quality Award at the 2013 Supplier Conference. AvaLAN Wireless has established, documented, implemented and currently maintains a quality management system and works to improve its effectiveness in accordance with the requirements of ISO 9001. “We are honored and humbled to be chosen as one of Daktronics’ top four suppliers to receive a vendor quality award this year out of over seven hundred,” said Matt Nelson, CEO and President of AvaLAN Wireless Systems, Inc.